Specifically made to suit you own requirements, the Plain ended kit comes complete with a suitable DobyGrip for the size of wire ordered. Kit B Made to customers own specifications of wire leg lengths, top non-looped. 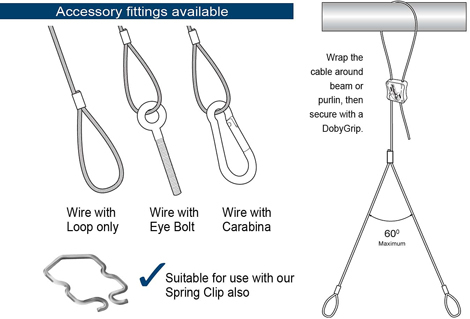 Height is adjusted using the DobyGrip included in each wire kit. Minimum leg length of 150mm to a maximum of 10m.